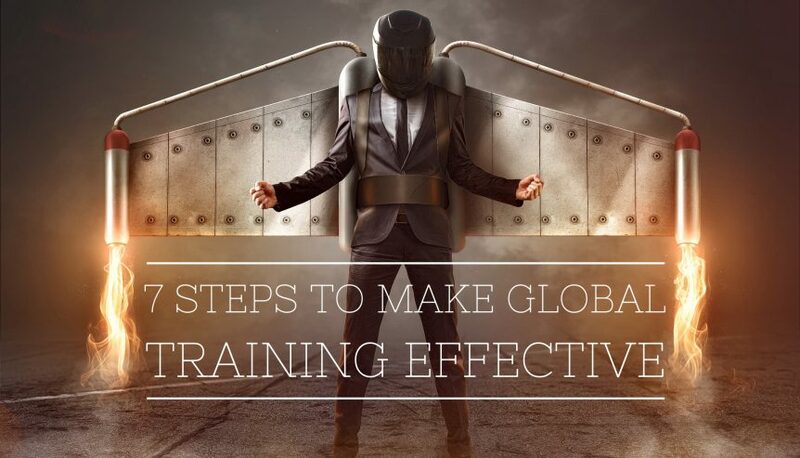 Implementing a global training initiative is a significant undertaking in any organisation. It is one that presents unique challenges too so requires careful and thorough planning as well as precise implementation. This will help avoid embarrassing and damaging situations such as including a joke in training materials that is funny in one part of the world but insulting in another. It also helps ensure all individuals get the same standard of training and that you maximise ROI. Careful and thorough planning plus precise implementation of global training requires seven essential steps. The starting point is to define the training initiative’s objectives. This includes identifying why you are doing the training and what you want to achieve. You should also think about how you will measure success. This could be by training completion rates, results of in-house testing, improvements in productivity, an increase in sales, and more. E-learning – where learners complete specially designed courses on their own using a computer or, increasingly, a mobile device. Blended classroom – where some of the learning takes place in the classroom with the rest delivered via e-learning. Synchronous training – a virtual classroom where there is a trainer and trainees, but where you use technologies like video conferencing to eliminate the need for travel. For global training initiatives, this is the most important step in the process. You must understand how people in different locations will view the training. This involves localising the language and references as well as ensuring you take into account cultural differences. This applies to all the content on the course including text, images, videos, quiz questions, and any other element. Most global training programmes can be split into two sections – the core parts of the content that everyone gets plus location and user-specific content. So, the next step in the process is to create the main content. One other note on this step: creating the course in a modular format lets you adapt the core content with localised content. Once you have the core content you can then customise it for each location. This includes adding location-specific content and adapting the core content – changing the language, for example, or using the local currency. You may also need to add user-specific customisation elements. An example of this is having multiple versions of some modules in the course that are different depending on the job role of the learner. For example, having different content for the production team compared to the sales and marketing team. The goal of this step is to make the core content of the course as relevant as possible to individual users, wherever they are in the world. This is an optional step but is one you should consider, particularly if significant numbers of learners will receive the training. Selecting a small group of learners as a pilot will identify problems with the course so you can make changes before rolling it out to your global teams. With e-learning, it is quick and easy to run a pilot, analyse the results, and then make the necessary changes. The final step is to review the implementation of the course, its success rate, and the reception of learners. You should also measure retention rates, i.e. how well did learners understand the content and how much of the information do they retain and then, crucially, go on to use. This information will help you analyse ROI but it also helps you refine this course and courses you create in the future. As you can see from the above steps, the process of developing global training is very different to creating other training programmes. Therefore, to get the best results, you should use an e-learning provider with experience of creating and implementing global training initiatives.